Osteoarthritis and degenerative disc disease run in Faye Bunker’s family. Her sister and her younger brother, as well as her late, older brother, all have had multiple back surgeries. So Faye was not surprised when she began having pain in her lower back and then her knees when she was in her 50s. In 2003, she had both knees replaced. Within a couple years, her back pain had grown worse and she also was having neck pain. She heard popping noises when she turned her neck. Soon, pain began radiating down her left arm. The orthopaedist who had performed her knee replacements referred her to Max W. Cohen, MD, FAAOS, a fellowship-trained spine specialist, for evaluation. Dr. Cohen found that Faye had cervical spondylotic myeloradiculopathy (degenerative disc disease with bone spurs and pinched nerves) in her neck. The disc between her C5 and C6 vertebrae was degenerating, and the space between those vertebrae in her neck was narrowing, leading to pinched nerves. 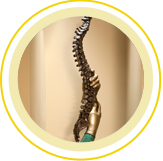 He also found degenerating discs in her lower spine, which were causing her chronic lower back pain. Faye tried conservative treatments, including physical therapy, pain medications and injections, for the pain in her arm and neck but it did not respond. 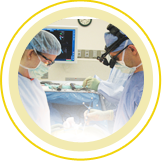 In 2007, Dr. Cohen performed an anterior cervical discectomy and fusion (ACDF), removing the bone spurs and disc that had degenerated and fusing together the surrounding C-5 and C6 vertebrae using bone grafts, a plate and screws. “I had almost instant relief,” she says. Then a year later, the pain began again. Imaging studies showed degeneration in an adjacent disc. Faye had a second surgery in 2008 to extend the fusion to C4. That eliminated her neck pain, but she continued to live with constant back pain. “The back pain was a ‘10′ and it never went away,” she says. Even though Faye’s back pain was a longstanding complaint, Dr. Cohen had advised doing her neck surgery before even considering back surgery because using a walker – part of the recovery phase of back surgery – would have been difficult with her neck problem. As her back pain grew worse, Faye returned several times to see Dr. Cohen, who advised continuing with conservative, nonsurgical treatments. Like many doctors, he encourages patients who have degenerative disc disease with chronic lower back pain to exhaust all other treatments before resorting to surgery. By 2009, Faye’s back pain had become unbearable. Imaging studies showed that the discs between L4 and L5 and L5 and S1 had degenerated. “I really couldn’t do anything without pain,” she says. The final straw may have been when she had to give up playing the organ at her church, something she had done for more than 40 years. Faye returned to Dr. Cohen’s office and asked again about back surgery. Even though she had decided surgery was the answer to her pain, she was a little frightened because her siblings had not fared well. Ultimately, it was her trust in Dr. Cohen that overrode her concerns. “I had all the confidence in the world in him because of the job he did with my neck,” she says. In June 2009, Dr. Cohen performed a L4-L5 and L5-L6 transforaminal lumbar interbody fusion with titanium screws in her lower spine. The degenerated discs were removed and a plastic cage was inserted to support the vertebrae. In order to avoid taking bone graft from her hip, synthetic bone grafts were used, along with the cage and screws, to fuse the vertebrae together. The initial recovery period in the hospital after her back surgery was difficult, Faye says. After she was discharged, she was able to use techniques she had been taught in the hospital to lie down and sit up. “Every day, things got better,” she says. Four months after her surgery, she drove to the beach by herself – following Dr. Cohen’s instructions to stop every hour as she drove. She believes his advanced training as a spine specialist gives him an edge in helping patients. Today, Faye says, “I’m totally pain-free for the first time in 10 years.” She once again exercises, does housework, enjoys playing with her great-grandchildren and is back playing the organ three times a week at church. She praises Dr. Cohen for his positive attitude (“He’s got a good personality about him – I just love him”) and his focus on helping patients. “I ended up at the right place, at the right time, with the right man,” she says with a laugh. “My husband wouldn’t be jealous at all that I said that, because he has his wife back. This entry was posted in Success Stories and tagged Degenerative Disc Disease. Bookmark the permalink.